First Day Festivities Kick off 2017-18 School Year! On August 29, Pacific Ridge students and faculty gathered to celebrate the beginning of the new school year. 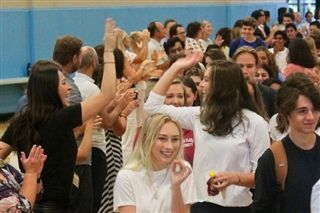 All of the students were greeted by faculty, with seventh-graders being the last to be seated, allowing them to enter the Athletic Center to roaring applause from their new community. After welcoming remarks from Dr. Ogle and All-School President Tommy Rogers, new faculty/staff introduced themselves. In keeping with Pacific Ridge tradition, a strike of the gong signaled the official start of a new academic year, and students headed, anxiously and eagerly, to their first classes.